Jaisalmer (The Golden City), The Golden City is a town in the Rajasthan. It is located 575 Kms from the state capital Jaipur. It was once known as Jaisalmer state. The town stands on a ridge of yellowish sandstone, crowned by a fort, which contains the palace and several ornate Jain temples. Many of the houses and temples are finely sculptured. It lies in the heart of the Thar Desert and has a population of about 78,000. It is the administrative headquarters of Jaisalmer District. The majority of any inhabitants of Jaisalmer are Bhati Rajputs, who take their name from an ancestor named Bhatti, renowned as a warrior when the tribe were located in the Punjab. Shortly after this the clan was driven southwards, and found a refuge in the Indian desert, which was henceforth its home. The Maharajas of Jaisalmer trace their lineage back to Jaitsimha, a ruler of the Bhati Rajput clan, though Deoraj, a famous prince of the Bhati clan during the 9th century, is esteemed the founder of the Jaisalmer dynasty. With him the title of “Rawal” commenced. “Rawal” means “of the Royal house”. According to legend Deoraj was to marry the daughter of a neighbouring chief. Deoraj’s father and 800 of his family and followers were surprised and massacred at the wedding. Deoraj escaped with the aid of a Brahmin yogi who disguised the prince as a fellow Brahmin. When confronted by the rival chief’s followers hunting for Deoraj, the Brahmin convinced them that the man with him was another Brahmin by eating from the same dish, something no Brahmin holy man would do with someone of another caste. Deoraj and his remaining clan members were able to recover from the loss of so many such that later he built the stronghold of Derawar. Deoraj later captured Laudrava (located about 15 km to the south-east of Jaisalmer) from another Rajput clan and made it his capital. 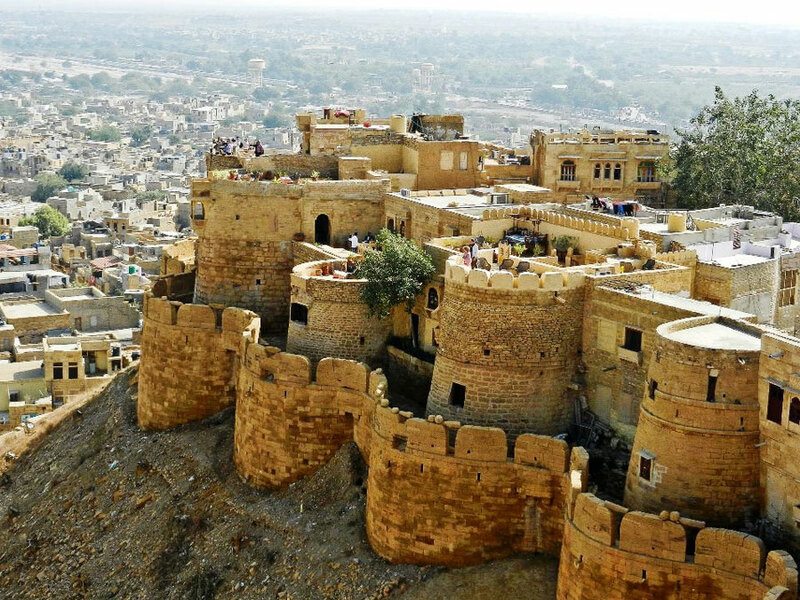 Jaisalmer Fort is one of the largest forts in the world. It is situated in Jaisalmer city in the state of Rajasthan. It was built in 1156 AD by the Bhati Rajput ruler Rawal Jaisal, from where it derives it name. The fort stands proudly amidst the golden stretches of the great Thar Desert, on Trikuta Hill, and has been the scene of many battles. Its massive yellow sandstone walls are a tawny lion color during the day, fading to honey-gold as the sun sets, thereby camouflaging the fort in the yellow desert. For this reason, it is also known as The Golden Fort. Guman Chand Patwa (and later by his five sons), a wealthy merchant belonging to powerful Oswal Jain community and banker who had over three hundred trading centres from Afghanistan to China. This ornate five-storey complex took fifty years to complete. This is the largest, the most magnificent, and the most elaborate of Jaisalmer havelis. It was built by the scheming Prime Minister Salam Singh in 1815. It has a beautifully arched roof capped with blue cupolas and carved brackets in the form of Peacocks. Built by a Prime Minister of princely state of Jaisalmer. Its facade is a riot of ornamentation: flowers, birds, elephants, soldiers, a bicycle and even a steam engine. The Vyas family built this lovely haveli Shreenath Palace – Hotel in Jaisalmer in the 15 th Century, and descendants of this family live here today. Shreenath Palace – Hotel in Jaisalmer was once inhabited by the Prime Minister of Jaisalmer, and guest are invited to stay in these rooms – there are only five available for the hotel – and join the Vyas family in enjoying this architectural treasure, and feel like aMaharaja for a few days. Some of the doors and ceilings are wonderful examples of old carved wood from many hundreds of years ago. Some of the doors have brass or iron fittings. The Desert Festival is one of the most popular cultural events on the annual festival calendar of Rajasthan. The colorful event is held every year at Jaisalmer in the months of January/February. The festival is a showcase of the performing arts and crafts of Rajasthan. The melodious tunes and rhythms of the folk musicians and amazing folk dance performances by renowned artists create a spellbound effect on spectators. The event is organized on the famous golden sand dunes at Sam near Jaisalmer. Colorful craft bazaars set up for the occasion are an added attraction of the festival. Jaisalmer Railway station is well connected with Jodhpur on meter gauge, which in turn is connected with all major cities. Jaisalmer is well connected by road with Jodhpur, Bikaner via Pokhran, Barmer with luxury ac coaches.